David Tangiers (Harley Di Nardo) was once a musician in a fairly successful rock band but following a family emergency had to quit and now he has become rather washed up in more ways than one. He is paying the bills by working as a hairstylist in a salon he runs with his wife Cecily (Samantha Smart). Feeling like a prisoner in this job David longs to return to rock stardom and whilst their business is failing wildly his devoted wife tries to help him kick start his comeback. They meet a shy, retiring chap named Javy Bates (Adam Reeser) at a battle of the band's gig who defends David when being heckled. They take Javy on as an apprentice at the salon and strike up an awkward friendship. Cecily discovers Javy's secret musical talent and believes that this will really help bring David back into the limelight, but when Javy helps Cecily through a panic attack she invites him round for dinner to say thank you... that is when they discover that Bates has a few dangerous obsessions. For the most part I enjoyed this movie. Ok, the music isn't quite to my taste but it's pretty well done and I do have a bit of a fascination with the mind of the obsessive music fanatic and the extremes they go to, so I was very interested to see how this story unfolded. I have to admit to being slightly disappointed by the execution of many of the more threatening scenes, they could have been a lot more sinister then they actually were. They kind of teased you into thinking that something quite disturbing was about to unfold but then they seemed to chicken out right at the last minute and went for something that was really rather tame. I fell for this trick a few times before I finally realized that nothing very shocking was ever going to happen but fair play to them for the deceiving build ups. They had a couple of separate but tenuously linked storylines going on that did have quite a lot of holes in which bugged me a bit and the ending wasn't exactly great.. The acting was pretty proficient from the main cast and at 71 mins long it was nicely paced and over and done with fairly quickly. 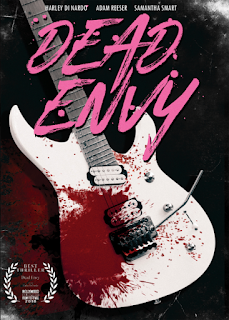 Written, directed and starring Harley Di Nardo , himself a musician with Closer and White Light Motorcade, it showcases his experience within the music scene and the film industry which has led him to create an acceptable low budget indie thriller. It is a big shame that it lacks the balls to really deliver on some potentially very effective scenes and produce more of a shock factor but it is well shot, the soundtrack is good, it doesn't drag and the characters have personality. Despite it's flaws it was still quite a good watch.